Dr. Oleh Slupchynskyj, a New York-based renowned Facial Plastic Surgeon, developed the minimally-invasive facelifting technique, the SLUPlift™, which delivers the same long lasting results without the need for extensive surgery, large incisions, General Anesthesia and a long recovery. As a 74 year old African-American woman, I was apprehensive regarding the SLUPlift™ Surgery. In the past, when I discussed Plastic Surgery with family and friends they spoke negatively about the surgery. Eventually I decided it was something I wanted to do for myself. I found Dr. Slupchynskyj while surfing the Internet and reviewing several of his before and after photos. After meeting the Dr. he assured me that I would be OK — and he was correct. Amazing! Truly amazing. I love it. Again, totally unbelievably fantastic results. I know a few friends that want to have it done as well and Dr. S. is definitely the man to do it. journey with doubts and fears as I would imagine most women do. ‘Should I? Shouldn’t I?’ was always on my mind. However, Dr. S. was always there to ease my mind at any given call. Office visits and phone calls were always available at no charge. His staff was as pleasant and helpful as he was. There was never a time when my questions were left unanswered or my phone calls weren’t promptly returned. I was never made to feel like I was a bother. This was also true in his postoperative visits. This to me is as important as the work the doctor is capable of doing. There are a lot of great plastic surgeons out there but to find one that is not only a genius in work, but also to have such compassion and caring for his patients is truly a blessing. Also, the other big factor that separated Dr. S. from other surgeons was that he was never pushy. He told you straight out what he believed you needed and let you take it from there. There was never any pressure to do the work. It has only been a week since my procedure and I already feel exuberant and alive like I did 20 years ago. I feel like I can do anything thanks to Dr. S. I can go on and on about this wonderful doctor but the only advice that I can give you is to go in for a consultation. After you walk out of his office, you will experience feelings that words can't describe. You have nothing to lose. I think Botox®™ is an amazing rejuvenation for anti-aging, but there is definitely an art to injecting it. Dr. Slupchynskyj's skill is not only making you look natural (no deer in headlights effect) but he is able to actually lift the brow area by a technique that few doctors are able to do. I've also had restylane under my eyes which has completely filled in the hollows. There is no one else I would trust to do any of these procedures. I was referred to Dr. Slupchynskyj through two separate women who had had the SLUPlift™ and were very happy with their outcomes. I saw them first hand and could see why they were happy. They looked younger and fresher without looking pulled and fake. I booked an appointment and from the first meeting, I was happy. I felt respected, my needs were considered and my many questions were answered. I scheduled my appointment and went ahead with the procedure. I was back at work within days and found my follow-up care with the doctor extraordinarily professional and caring. I called with a concern and he got right back to me and answered my questions. I am very very happy with the result and would recommend his work enthusiastically. I had Plastic Surgery with Dr. Slupchynskyj (Dr. S.), on June '09, and I am thrilled with the results. He worked on my lower face and jaw. My recovery was speedy, and today the area of my neck and jaw look like it did 15 years ago. I choose Dr. S. because I was very impressed with the surgery he performed on my best friend. She had her eye lids done by him and the job looks great. In addition, my friend's husband is a doctor and he admires Dr. S.'s Plastic Surgery work. I am so happy with his ability as a surgeon that I have scheduled my 16-year-old-daughter to get Rhinoplasty with him. I decided to have the SLUPlift™ procedure two years ago when I noticed that my jowls were mirroring those of a Bassett Hound, loose and hanging. The SLUPlift™ experience was painless, seamless, convenient and offered immediate, visible results. In 60-90 minutes the jowels were gone. It was a wonderful experience! And I continue to be thrilled with the results! I continue to have co-workers and friends approach me to ask, 'What cream do I use on my face' or, 'What corrective wrinkle product do I buy?' The secret is not in the cream or the wrinkle product-it's the SLUPlift™! I decided to make a change because everyone was asking me if I felt okay. They said I looked very tired and I was not tired and I was feeling good. So I knew something was wrong. I'm very happy that I decided to have something done and I found that it was a very easy experience. All the personnel working for the Doctor were very kind and considerate and I especially remember one of the girls ordering me a cup of soup along with her lunch order before she let me leave the office after my procedure. It gave me the lift I needed on that very cold day. Two weeks later I went on vacation and no one was aware that I had something done. They just said that I looked great. It’s not quite two weeks since my Facelift Surgery. I only missed two days of work. I’ve had a few follow-up visits, and I am so excited about the new face in the mirror. I’ve been given the chance to roll back the clock about 10+ years. What is most appealing, is that I’ve received so many compliments, with everyone thinking I’ve just changed my hairstyle, not asking about my Facelift. I think that’s the sign of wonderful surgery. My close friends are now aware of why I look so much better, and they are all getting ready to schedule their own times with the doctor. For decades, patients have fervently pursued the goal of looking younger through Cosmetic Surgery. The Traditional “Facelift” has allowed men and women alike to take ten years off their apparent age by tightening loose skin, and restoring the face’s youthful resilience and contours. While many patients still choose this conventional route, others often seek out newer and much less invasive techniques earlier that offer the same benefits, which means no more lengthy surgical procedure and the extensive recovery time. Dr. Oleh Slupchynskyj, a New York-based renowned Facial Plastic Surgeon, developed the minimally invasive facelifting technique, the SLUPlift™, which delivers the same long lasting results without the need for extensive surgery, large incisions, General Anesthesia and a long recovery. Patients who choose to undergo a Traditional Facelift often wait until the signs of aging are obvious in order to justify the procedure. Some conventional Facelift recipients may wait until they are 65 or older to take on the process; although the signs of a more youthful appearance will become more evident, the patient also risks more complications due to both the trauma involved in the technique and the patient’s advanced age. Patients with less obvious aging often select the SLUPlift™ procedure, as it is both less traumatic and more effective in those instances. Even patients in their late 50s or early 60s can see immediate improvement after the SLUPlift™ Surgery. In a Traditional Facelift procedure, the surgeon makes an incision starting from the hairline at the temple, curving around the ear, and ending on the opposite side. In some instances, the surgeon may also make an incision under the chin to tighten up loose skin around the neck and jowls. When the surgeon makes the incision he (or she) will pull the skin away from the underlying fat and muscle and hold in place. The tissue layer directly under the skin, known as the Superficial Musculoaponeurotic System (SMAS), is the target area in a Facelift procedure. The surgeon will fold back the SMAS layer until the underlying tissue is pulled tight, then replace the skin layer and remove any excess skin. Sutures or surgical glue are then used to close the incision. The procedure typically takes 2 to 4 hours and requires the patient to be under heavier General Anesthesia. Dr. Slupchynskyj’s patented SLUPlift™ accomplishes many of the same goals as a conventional Facelift, but with a more effective and less invasive technique. Instead of the long incision around the entire ear used in a traditional procedure, the SLUPlift™ employs a small incision around the earlobe. Dr. Slupchynskyj inserts tools in that smaller incision to locate the SMAS and the platysma muscle (found in the lower jaw and upper chest). Dr. Slupchynskyj then inserts sutures through those tissues and pulls them tight. The sutures are tied off behind the earlobe, the excess skin is removed and the incision is sealed with micro-sutures. The SLUPlift™ procedure typically takes anywhere from 1 to possibly 2 hours. The results are a tighter and more youthful appearance to the face and neck, with a much smaller incision, shorter time in surgery, no General Anesthesia and a quicker recovery. As with Traditional Facelifts, the SLUPlift™ tightens the skin around the lower face and neck. The excess skin is carefully removed and the results can last up to 10 years for most patients; however, the SLUPlift™ technique has several advantages over the traditional methods. One of the primary advantages of the SLUPlift™ procedure is the reduced incision size. The smaller incision exposes the patient to less trauma, allows for less scarring and reduces the post-operative recovery period. The SLUPlift™ procedure is minimally invasive, which benefits both the surgeon and the patients. Dr. Slupchynskyj’s process has the patient rest comfortably during the operation under Local Anesthetic, without the need for the patient to “go under” with General Anesthesia. The quick, easy procedure also allows the patient to experience a much lower incidence of swelling, bleeding, infection or any other post-operative trauma, while seeing immediate results. Patients often recover in a week or less and return to their daily lives in 5 to 10 days. Another advantage of the SLUPlift™ procedure is that it allows for as much or as little adjustment to the face as the patient requires. This technique gives Dr. Slupchynskyj some much-needed flexibility in adjusting the tension of the skin to suit the patient’s desired outcome. The additional flexibility allows him to work on the lower face and neck region, including the jowls and the skin around the platysma muscle, while also removing or rearranging the surrounding fatty tissue (a process known as “Submental Liposuction”). The smaller incision around the earlobe enables the surgeon to adjust the skin and underlying tissue with “microneedles” and sutures, rather than with cruder tools that may cause trauma during or after the procedure. The SLUPlift™ technique achieves the optimum results for patients that require mild to moderate wrinkle removal, with much less post-operative swelling and bleeding. This facet of the technique uses a “bloodless” incision that identifies the SMAS and platysma muscle, without the need to remove or relocate the overlying skin. Since the incision is so much smaller and much of the work takes place below the skin surface, the patient experiences much fewer problems during recovery. In a Traditional Facelift procedure, the patient is administered General Anesthesia, either intravenously or through inhalation. The patient is unconscious and, as a result, requires strict monitoring by the surgeon, the Anesthesiologist and the surgical support staff to make sure that he or she does not suffer any ill effects during surgery. Since the Anesthesia can paralyze the muscles responsible for breathing, the patient receives an intubation tube down his (or her) throat that feeds oxygen into the lungs. Patients can suffer from breathing problems, vomit in the lungs, low blood pressure, and other problems while under General Anesthesia. The SLUPlift™ procedure employs Local Anesthesia to the affected areas of the lower face. The patient does not experience any paralysis and can respond to both verbal and touch cues from the surgeon. The patient also does not require any breathing assistance during the procedure and experiences only a slightly lower level of consciousness than normal. The administration of Local Anesthesia also does not require an Anesthesiologist to monitor the patient’s level of responsiveness or the addition of more numbing agents to keep the patient under during the procedure. The reduced need for Anesthesia also allows for a faster post-operative recovery period. Patients experience the key advantage to the SLUPlift™ procedure after the operation, as recovery times are much shorter than those experienced by patients who undergo the Traditional Facelift Surgery. While the conventional Facelift procedure can take up to 4 hours, the SLUPlift™ procedure takes only 60 to 90 minutes. The smaller incision and lack of General Anesthesia makes for a faster and easier experience for both surgeon and patient. While most patients may need up to 2 weeks or more for immediate recovery from a Traditional Facelift, patients who undergo the SLUPlift™ procedure often return to work within a week. Since the patient does not receive General Anesthesia, the recovery process begins almost immediately following the operation, while the minimal scarring and bruising allow the patient to see the results of the SLUPlift™ within a few days. The longer incision used in most Traditional Facelift procedures can lead to the appearance of unflattering scars and hair loss near the incision sites. Also, some patients who undergo a Traditional Facelift may see a deformity in the earlobe after the surgeon reattaches the loose skin. This deformity, known as “Pixie Ear”, is often a highly noticeable sign that the patient had a Facelift. The SLUPlift™ procedure leaves the patient with much less of a noticeable scar and no hair loss. Since the incision does not detach the earlobe from the face, patients are not at risk of having a “Pixie Ear” after surgery. Numerous patients who have undergone the SLUPlift™ procedure have submitted “Before” and “After” photos that show the remarkable improvement in the lower face and jaw regions. Many of these patients have also corresponded with Dr. Slupchynskyj and his staff about the benefits they have experienced after the surgery. The philosophy behind the SLUPlift™ can be summarized as “less is more”. The procedure takes much less time, staff and effort than the conventional Facelift Surgery, but delivers results on par with, and sometimes surpassing, those found in patients who underwent the Traditional Facelift. Smaller incisions, less trauma and faster recovery times allow patients to see immediate, long-lasting results from the SLUPlift™. We frequently hear about how doctors change patients’ lives. What if the tables were turned? Can a patient change a doctor’s life? The answer is not so obvious and may surprise you. As a Facial Plastic and Reconstructive Surgeon, a big part of my job is listening. Listening to a patient’s complaints, worries about their state of health, their life circumstances, their disappointments and their hopes. Much of my work involves removing various types of Cancer from the head and neck, including Skin Cancer. Typically, those I see with Skin Cancer are older, many in their 70s and 80s. Unfortunately, with this age group, they tend to experience Skin Cancer such as Basal Cell Carcinoma or Squamous Cell Carcinoma more than once. One patient who came to see me with Skin Cancer was an elderly man named Thomas. He was 85 years of age. He was sharp as a tack and gregarious. He made me laugh as we talked and joked about so many topics during his appointments. What stood out to me was that he never complained. About anything. Not even when I informed him that he had Skin Cancer that needed to be excised, neither before nor after I operated on him and neither at his follow up appointments. This is markedly different from my doctor experience when Cancer is involved. Thomas came to see me many more times over the years and well into his ninth decade in life. Each time he had to undergo surgery, he never complained and continued to be that fun, talkative gentleman with the same sparkle in his eye he had at 85 when I first met him. I wanted to know his secret. He asked me about my family and history and I asked him about his. He started talking and I listened. 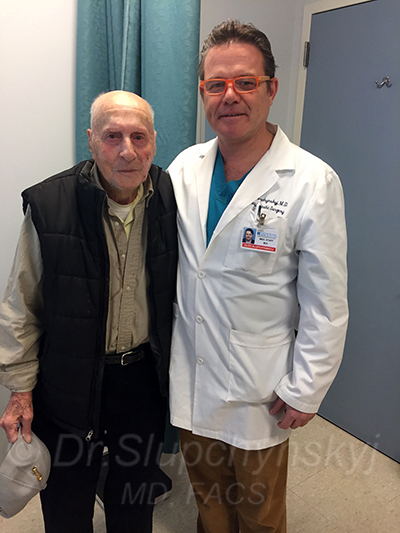 My patient, Thomas Stivale, is a WWII Army veteran. He was born in 1919 and said, “We didn’t have doctors back then. We were all delivered by mid-wife. I was brought up on goat’s milk.” He graduated from Bloomfield High School in 1938 and became a Paratrooper in the 82 Airborne Division. He discussed events that surrounded him during this time, the people with whom he lived and his thoughts as a young soldier incarcerated as a prisoner-of-war deep within Nazi Germany for close to two years. I continued to listen intently. Thomas and the other prisoners worked on a potato farm around the area of the camp. The biggest potatoes would go to Hitler and the smallest were to feed pigs. They received censured letters from home where the Germans would black out the words “I love you.” The prisoners had no connection to the outside world. Thomas was freed May 2, 1945. “Freedom at last,” he said yet immediately was captured by Russians and one of his friends was shot. “Would never want to live that day over. I was in Russian hands for two days.” Finally, on May 4, 1945, Thomas was on his way to America and back into the arms of his fiancée, Pauline. Thomas, a good-natured and patriotic POW at 97 years young, may have all the physical signs of aging but he is humble, sharp, fearless and still likes to go bowling on Thursdays. He keeps ticking with a contagious smile on his face. That’s perseverance and that’s hope. Thomas makes a conscious decision to live his life with this positive state of mind and age truly becomes just a number. It is an incredible honor for me to be able to treat a WWII survivor and hero. We often forget our elders and what they can teach us. Thomas is the perfect example of why we should never forget them; how we can learn from their wisdom and experience to better our lives and be determined, like Thomas, to live with perseverance and hope. This he has done for me. Personal, true experiences from patients who have undergone a cosmetic treatment are an important component for any prospective patient considering the same. Reviews of Oleh Slupchynskyj, MD, FACS, which are shown below, come from an unbiased web community called RealSelf.com, where millions of people go to learn about making the right health and beauty choices. Contact us today to find out why patients choose us for the SLUPlift™, which delivers the same long lasting results without the need for extensive surgery.